» home » magazine » 2012 » march 2012 » oberg retools to "give 'em what they want"
Oberg Retools to "Give 'em What They Want"
Used to be that the dies designed and built by Oberg Industries, primarily for motor laminations, were engineered to last for years and years, fortified to endure 100 to 200 million hits/yr. Oberg officials lovingly call those dies “Oberg dies,” in deference to their state-of-the-art design characteristics. We’re talking about die sections split and ground to ultra-fine finishes, spring strippers mounted on independent guide posts, carbide-tipped piloting, punches with runouts to promote long life, the use of high-end ball-bearing guide components and Meehanite cast-iron die sets. Over the last 3 yr., Oberg has invested more than $10 million in new machining equipment, including the addition of special machining platforms that the firm has customized to perform its proprietary Molecular Decomposition Process (MDP), shown here. 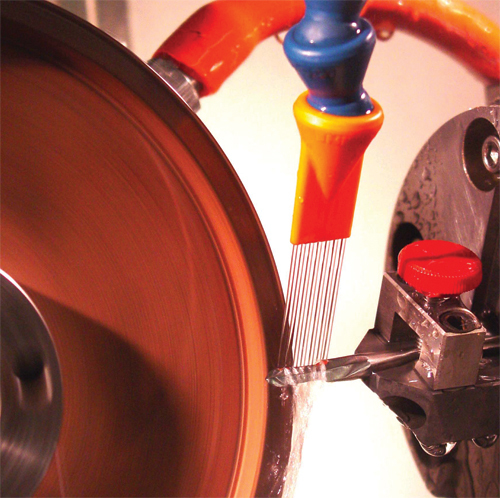 During MDP, a cathode-anode relationship between the abrasive wheel and the workpiece enables stock removal as much as 80 percent faster than with conventional grinding. Life changed for Oberg, Freeport, PA, during the early part of the new century, as more and more of the firm’s stamping customers began to seek lower-cost tooling solutions. At the same time, its own stamping facilities began to diversify into new markets, beyond laminations—markets such as medical, aerospace and military. In response, Oberg management decided to look for new s to compete, and as a result, in 2007 it developed its Series I, II and III dies. It did so after adding 50,000 sq. ft. to its manufacturing facility in Sarver, PA, built to provide additional room for research and development and to allow for testing of its new modular die designs. Traditionally, about 85 percent of the dies designed and built by Oberg are for outside customers. The remainder supports its two stamping shops—in Sarver, PA, and in Tecate, Mexico, just south of San Diego, CA. As Oberg’s customer base has evolved, so has its toolroom and, as described above, its approach to die design and build. Series I dies (“Oberg dies”) now account for only 10 percent of the tools it develops, says Dave Rugaber, executive vice president of sales and marketing. The majority of its dies (60 percent) fall under the category of Series II, the remainder Series III. While nearly all die assembly occurs at the company’s Freeport facility, it operates a machining, grinding and EDM facility in Costa Rica that supplies about 30 percent of its die components. Dies Made Your Oberg offers dies designed and built to three clearly defined standards, based on expected part volumes, quality and product life. Punch-to-die clearance less than 0.0008 in. Clearance equal to or greater than 0.0008 in. Using MDP, which Oberg now has installed on more than 10 grinding machines (three of which are dedicated to toolroom activities, the rest for production machining), allows full-depth cuts to be made in one pass with surface finishes to less than 1 Ra. In addition to new equipment, lean processes installed in recent years have allowed the firm to surpass industry standards for lead times, says Rugaber. Oberg has the same number of wire-EDM operators it had 5 yr. ago, but is sending 30 to 40 percent more product out the door. This is due, in part, to automation that enables unattended machining. Asked to cite where these improvements are coming from, EDM manager Jeff Ambrose quickly cites the implementation of automation—robots and palletizers, for example—throughout the EDM department. Ambrose’s department is stocked with a variety of EDM machines, including 16 wire and seven sinker machines; another six wire machines are installed at the company’s Costa Rican plant. 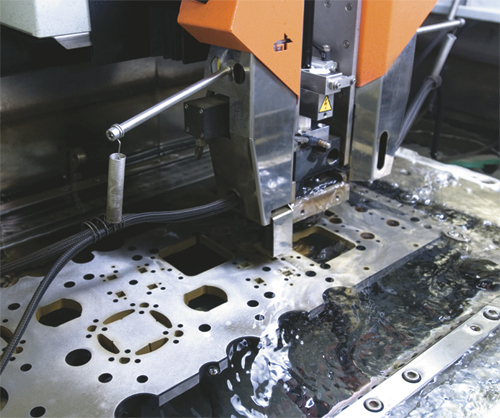 Each machine make, says Ambrose, is geared toward a specific category of operation, from basic roughing to fine machining. Wallace notes that the rest of the toolroom functions similarly, calling out its high-speed machining operations and noting that for Oberg, high speed truly means high speed—we’re talking up to 40,000 RPM.